On Saturday 18 November, His Royal Highness, The Prince of Wales, Prince Charles made his first visit to the British Virgin Islands to see for himself the devastation caused by the three unprecedented events: the Tropical Wave and Hurricanes Irma and Maria. He was accompanied by Rt Hon Penny Mordaunt MP, Secretary of State for the Department for International Trade in the UK. 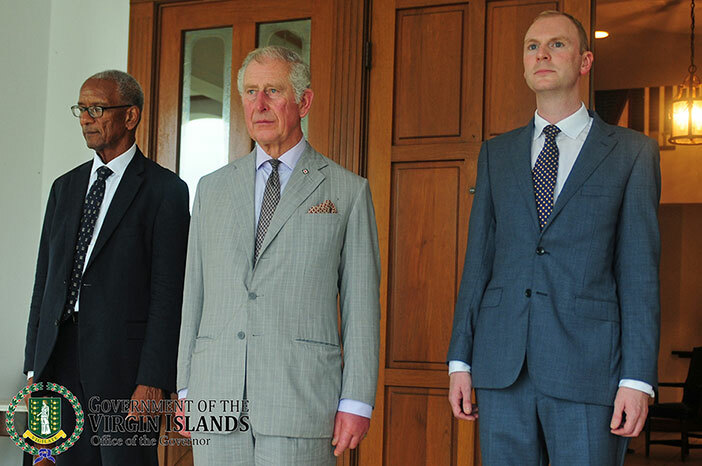 He was welcomed to the Territory by His Excellency the Governor Agustus Jaspert and the Premier, Dr. the Honourable D. Orlando Smith, OBE. During his visit he briefly toured the island with the Governor to see some affected areas on Tortola. He then met local communities to hear about the ways they have been recovering since the islands were hit. He visited the Youth Empowerment Project (YEP), which has fought back since the storms to get up and running. There he met some of the young people who have been a part of new support programmes which encourage them to talk about storm experiences and equip them with practical life skills to cope with difficult living conditions. As President of the Red Cross, he also visited the local branch to see some of the fantastic work of the volunteers and the difference this has made to people’s lives. There he was introduced to a number of volunteers, including Deniese Gardener who risked her life in the middle of the storm along with two others to rescue a local woman. He was also shown the Emergency Food Bank and heard about their work in shelters, both of which have been supporting families across the Territory. 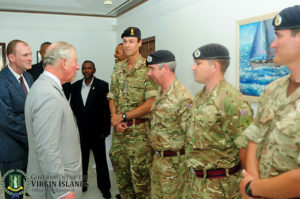 This was his first official visit to The Virgin Islands, and the first Royal visit since the Duke of Gloucester in March 2012. He met local Police and Fire Officers on arrival at the airport who went above and beyond in the immediate aftermath of Hurricane Irma. He visited the Youth Empowerment Project, to meet with local young people to hear their experiences since Irma. YEP is a community led programme centre that in usual times provides leadership development, educational and sports projects for young people. Since Hurricane Irma, they have been running support programmes to encourage young people to talk about storm experiences and equip them with practical life skills for coping with difficult living conditions. He visited the local Red Cross to commend them on their hard work through the storm and after. Here he was briefed on the Household Assistance Programme and other programmes they run. He was shown the Command Centre and receive a short briefing by Geoff Brooks on his personal experience at evacuating the Department of Disaster Management/NEOC in the middle of the hurricane. Along with Deniese Gardener, a volunteer who risked her life in the middle of the storm to rescue an individual, he was introduced to a number of other volunteers such as Lornette Stevens who has been involved with house to house and shelter assessments. Then we was shown the Emergency Food Bank and was introduced to four High School students who volunteer at the Food Bank every day after school. 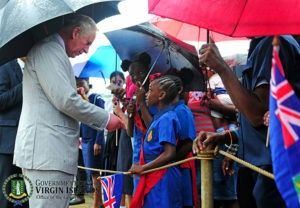 He visited Queen Elizabeth II Park, where he met with members of the public including girl guides, scouts, other youth groups, NGOs and Members of the House of Assembly. A Steel Pan band was playing alongside a short cultural performance.